I write this Blainletter with a heavy heart. Just when I arrived back in Toronto from Donna Louthood's memorial service (she was Allan Fraser's wife of 30+ years) only to wake up next morning to the news that Daisy DeBolt, Allan's partner in Fraser & DeBolt, had just passed away. Both were gone before the doctors could even complete their "tests." A friend noted that this time of year is a very busy time for funerals. Then it was Bert Jansch and Steve Jobs. Well, to quote Daisy, we should "Live Each Day With Soul"
Many of Daisy DeBolt's musical friends and colleagues will gather to remember Daisy and honour her significant contribution to the Canadian music scene since the 60s. Co-hosted by myself and George Koller with performances from Daisy's son, Jake DeBolt, Allan Fraser (her partner from Fraser & Debolt), David Woodhead, Richard Bales, Michelle Josef, Teddy Fury, Brent Titcomb, Tony Quarrington, Margaret Stowe, Evelyn Datl, Tina Kiik, Grier Coppins, John Switzer, Michal Hasek, Jaro Czerewinec, Matt Zimbel, Sultans of String with Chris Mckhool, Bill Bourne, George Koller/Julie Michels, Magoo, Mark Sepic, Grindl Kuchirka, Heather Katz, Naomi Tyrrell, Steve Fruitman and Lloyd Greenspoon. George wrote "With each album it seemed as if a new circle of musicians were added to her extended family of friends and admirers and she was never happier than when she was with as many friends as possible...On this evening.. friends meet friends... and we all celebrate Daisy DeBolt"
Celebrated my birthday at Hollywood on the Queensway with Lily's band, Groove Corporation and I danced the night away. They got me up to play a couple of tunes, too. Next was Bill King's CD launch at the Orbit Room. Now that was an old-school CD launch with drinks and and some fine BBQ. I guess it helps that this project was financed by the deepest pockets in the music business, Gary Slaight. A 4-shrimper (as I used to rate these events back in the golden era). While I was in Montreal for Donna Louthood's memorial, we got the guitars out a few times (it's theraputic) and since getting back I've done a little jamming with Daisy's son, Jake. In Montreal we played a game of "What's the oldest original song you remember?" As it turned out, my friend Sue Lothrop had the lyrics of some of my earliest tunes so I was able play some of my oldest, long-forgotten songs – even the first song I ever wrote (about my father…"you went off to war in nineteen thirty-nine, came back a hero after serving your time…"
After a couple of false-starts, I was finally on Danny Marks' Bluz.FM radio show. It was pre-recorded and I only heard a little bit of the broadcast on my walkman because while it was airing, I was in the second row of Mavis Staples at the Southside Shuffle and what an uplifting performance that was! I tried to listen to a bit of the radio but who would you rather listen to - Mavis Staples or Brian Blain? That's a no-brainer. A lot of people must have heard it, though, because I had many comments. I was asked to MC the Toronto Blues Society's showcase at the Ontario Council of Folk Festivals conference in Niagara Falls and that was fun. Suzie Vinnick kicked it off with an acoustic set then the Richard Henderson with his Hawaiian guitar. Then TBS talent search winners 24th St Wailers and Bradley Boy rocked the house – maybe just a little too much rock for the folkies. We were up against the star-studded East Coast Music showcase downstairs (so packed I couldn't get in). I got to play a tune in the middle (they call that a "tweener") but as MC I probably wasn't exactly a seasoned pro. Two of the acts ended up introducing themselves, Henderson because your (barely)managing MC (moi) was schmoozing in the hall and then Tracy K just launched into her set without me. The blues jam that followed was fun but there was not much of an audience, even though there were a few high-profile participants like Michael Jerome Browne, who is amazing (he's having a CD release at the Gladstone on Dec 3). Once again, a great opportunity for some blues players who never met to jam together but not that important in the grand scheme of career development. Next day we did a mini Blues Campfire Blaincast direct from the hotel room. I was delighted that the Rev Max Woolaver joined us. I originally met him through Marg Stowe and Michelle Josef. He really has something all his own (and isn't that what we all seek). David Nigel Lloyd played his unique guitar-like instrument called the "octar" and a young lap-slide player called Dekota knocked me out. Bill Bourne, another instantly recognizable artist, dropped in for a couple of tunes but regrettably, there were a few technical issues with the streaming (ie, interference from a live baseball game ?!?). Anyway, there's a little taste of the stream archived at www.brianblain.ca (lesson of the day: lighting is everything). It is pretty amazing that for eighty bucks (my share of the room cost) and nothing more than a laptop (and a light) I was able to broadcast to the world. Try it yourself…ustream.com. The OCFF conference was, as usual, a giant group-hug for the folk community. 600 earnest young folksingers and a few old geezers like me playing for each other and the occasional festival booker. I didn't do much "bizness" but I had a great time catching up with old friends. Unfortunately, the room was closed when I went to deposit my CD into the boxes that the festival directors take home but I shan't worry about it. They all got a pre-release copy in their box last year and nary a one replied, even to acknowledge receipt. You've got to be pretty aggressive to get attention these days – not my style. I remember one industry leader saying that the only artists that he's interested in are the ones who are "larger than life"…I think Matt Andersen's got that wrapped up. My highlight of the week-end was Manitoba Hal – he put on a great set and I was captivated, even though he's made his name doing the uke-blues thang, he's great on the guitar and I look forward to seeing him play for a whole evening. And he might just qualify in the "larger than life" department. I left early on Sat, but thoroughly enjoyed myself - probably because I went with no agenda and no expectations. Keep an eye on my website for more Blaincasts and other ramblings. 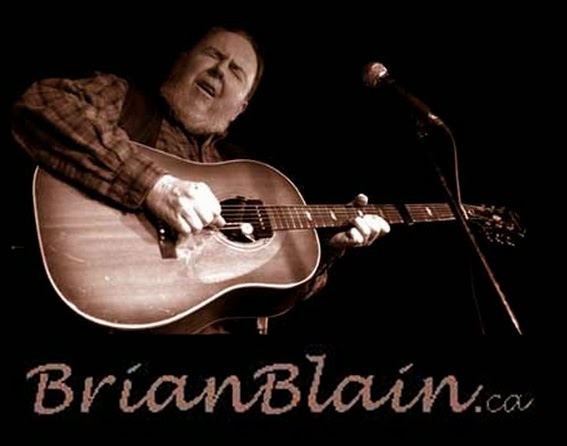 If you're on Facebook and “like” my music, go to www.facebook.com/brianblain.musician and make it official.